Uncover the groundbreaking super women who fronted the history of DC Comics! 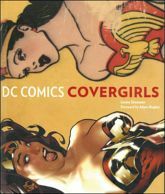 From the trailblazing Wonder Woman of the 1940s to edgy, power-driven comics series like Birds of Prey, this book takes a look at the female characters of DC Comics throughout the company's history, and features many of DC's iconic covers. Explore and examine the evolution of the women of DC Comics with this comprehensive comic book cover anthology. You will follow the 1942 introduction of DC Comics' most famous heroine, Wonder Woman, and her various incarnations up to the present day all-female super hero team, Birds of Prey. Discover the creation of comic book spin-offs based on famous characters like Lois Lane. The recent wealth of fierce female-driven titles, such as Supergirl, Promethea, Catwoman, and Batgirl, illustrate development in the way we tell the stories of women. Famous contributing artists include Jim Lee, Alex Ross, Adam Hughes, J. Scott Campbell, Michael Turner, Darwyn Cookie, Jill Thompson and many more! Each cover is annotated with publication year, issue number, series, author, colorist, and more for an in-depth survey of the series that each comic was a part of. Also included are covers from other DC properties, such as the gritty fantasy graphic novels of Vertigo, as well as cover girls from Wild Storm, Image, Helix, and America's Best Comics. Take a fun, smart, engaging look at the greatest super heroines of yesterday, today, and tomorrow! You will follow each heroine's story line through her cover art in this tribute to DC's crime-fighting females!